In October, our unit in Natal, in the Northeast of Brazil, engaged in two important actions aiming for our employees to have a healthier life. From left to right, top to bottom: Irisnayde Maria Araujo , Administrative Support; Emmanuela Oliveira, HR Analyst; Francisca das Chagas , local Chef; Isabelli Cristina, Work Safety; Jordana Camille, Quality Supervisor; Neilma Cesario, Administrative Analyst; Danielly Cristina, Young Apprentice and Maura Deise, Quality Support. Globally, October is known as the worldwide breast cancer awareness month. To help our local colleagues to understand its importance and care for their own or their relatives’ health, LSG Sky Chefs NAT initiated the Pink October campaign. 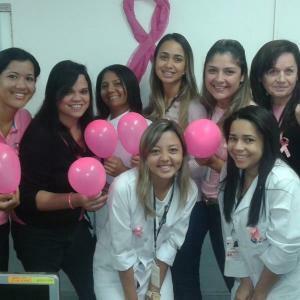 The cafeteria area was decorated in pink and all employees received a pink ribbon to pin on their chests. The breast cancer auto examination routine was also hanged on the walls and distributed, ensuring our female employees were aware of how to exam themselves and that our male employees could help their female relatives and friends to get this information. The team felt so engaged that many female employees came dressed in pink for the campaign launch. 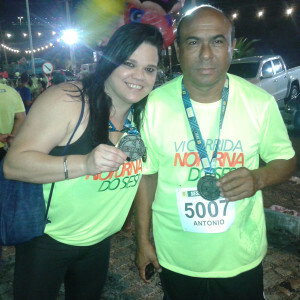 On October 11th, a team of five of our LSG Sky Chefs Natal employees participated in the 6th edition of the SESI Night Run in their city. This is a recurrent event where participants can run 4 and half, 7 or 10 Km by the ocean. As LSG Sky Chefs is part of SESI (Industry Social Services organization) in Natal, the employees’ registration for this marathon was free and encouraged by local HR. The organizer supported the participants by encouraging and providing a place for training in the region. Congratulations to our marathoner colleagues!